British consumers flocked to snap up affordable Android tablets in 2013, with slates running Google's mobile operating system owning 56 per cent of sales in the first 9 months the year, according to new stats. Tablets like the Google Nexus 7 and Amazon Kindle Fire range, proved massive hits, alongside cheap alternatives like the surprise Tesco Hudl, and own-brand solutions like the Argos MyTablet and Aldi Lifetab. That leaves the iPad with a 38 per cent share of the pie, IDC claims, although the arrival of Apple's most most impressive line-up, yet with the iPad Air and iPad mini 2, may have spearheaded a rival in the Christmas season. However, the Air and Mini 2 start at £400 and £320 respectively, and the figures for the first 9 months suggest British shoppers are more concerned with value and functionality over high-end specs, design and high-powered apps. "The very low end tablet market saw very strong sales this year, which is something we're expecting to continue into next year and beyond – especially for Christmas," said IDC research director, the awesomely-named Francisco Jeronimo. According to IDC demand for tablets was up 92 per cent in the UK during the first three quarters of 2013, with 7.6 million shipments in total. 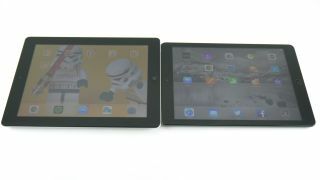 Whether the iPad was able to gain ground during the final three months of the year remains to be seen.